Last Sunday, my bridal party congregated in Pittsburgh for a day of dress shopping. The trip was a success, but all that shopping left us very hungry so we headed to Bella Frutteto in Wexford for dinner. Bella Frutteto is located in a strip mall just off of the I-79 Wexford exit, at the opposite end of where Eat 'n Park is located. It's a pretty cozy and comfortable restaurant, probably a bit more upscale than one would expect given its location. I was intrigued by the Apple Ravioli, described as "Granny Smith apples sautéed with amaretto, golden raisins, and balsamic-roasted figs in a fresh sage butter sauce atop jumbo cheese raviolis." 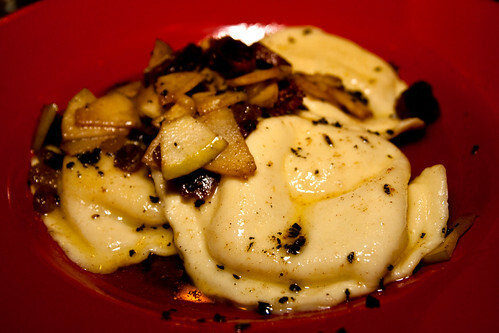 I loved the tart, fruity combination and it was a refreshing way to lighten up the flavor of heavy cheese raviolis. Very summery. I only wish it was less greasy. I wouldn't call the food at Bella Frutteto phenomenal, but it was pretty good and my dining companions all enjoyed their meal as well.